The LG PF1000U is in a class by itself. You might think of it as a portable 80" flat panel TV. It weighs under 5 lbs so you can take it anywhere. It is ultra short throw, so you sit it next to a wall and project high contrast full HD 1080p images up to 100" diagonal. It has a built-in VHF and UHF TV tuner and some smart TV apps like Netflix, VUDU, and YouTube, so plug it in and you're in business with a flat screen TV replacement. The picture quality is gorgeous when viewing in a dark room if the screen image is not pushed too big. At 60" diagonal it absolutely sparkles, at 80" it solid and engaging, and at 100" it is lower in contrast, but still quite serviceable. We wouldn't push it beyond that. LG is correct to state in the specs that the PF1000U is for images in the 60" to 100" range. And keep in mind when ambient light is introduced the contrast fades noticeably, particularly at the larger screen sizes. If you plan to watch in a room with indirect ambient light or a lot of white, reflective surfaces, you are better off staying in the 60" to 80" range for image size. All projectors look better in the dark, and it is especially true of this one. Contrast and color saturation on the PF1000U are rich and superb at screen sizes up to 80", and begin to fade as you move toward 100." On our sample, color balance in Cinema mode was natural and not in need of any fine-tuning to remove obvious color biases, so it was quite watchable right out of the box without any need for calibration work. As a huge added bonus, we saw virtually no DLP rainbow artifacts, which is always great news for an inexpensive DLP cinema projector. This projector does clean, pretty much artifact free 3D using DLP-Link glasses which are not provided. As always, the 3D image is quite a bit dimmer than standard 2D projection, but it is high contrast, engaging, and works well. The PF1000U has two 3W speakers on-board. The speakers are not great, but they give you some basic audio in the event you do not have a surround sound system or at least an external sound bar, either of which would be highly preferable for a more immersive theater experience. Another key feature is the 30,000 hour LED light engine ... there is no such thing as a replacement lamp on this unit, so it will run for the rest of your life, or 30,000 hours of video, whichever comes first. Brightness. LG rates the PF1000U at "up to 1,000 lumens" but the rating carries an asterisk. The issue is that LED projectors generally do not meter as brightly as lamp based projectors for an equivalent perceived image brightness, so there is some subjective judgment involved in trying to equate them. Essentially the LG rating is saying that if this were a lamp-based projector it would meter up to 1000 lumens. With that said, our test unit measured 485 ANSI lumens in the brightest preset modes, Vivid and Standard. We agree that the image looks brighter than that reading would suggest. In our subjective estimate the perceived brightness of the image would be the equivalent of about 700 lumens on a lamp-based projector. The Cinema mode measured a bit lower, at 435 instead of 485. But the picture quality is superior in that mode, so it is worth the small hit in luminance. What this translates to in real life is this: the PF1000U is not an overly bright projector. However due to its high contrast, its light output is sufficient to make it look plenty bright on a 60" screen, even with a moderate amount of ambient light in the room, and is even quite serviceable up to 100" in a dark room. If you turn the lights off you get a great picture at 80" diagonal, which in our subjective judgment is the ideal trade off between image size and image quality. Low Lamp Modes. ECO mode drops image brightness in two steps (Medium and Maximum) by 20% and 42%, respectively, and quiets the fan down in the process. Brightness Uniformity. On the 100 IRE white screen image, our test unit measured a uniformity of 86%, which is very good for any projector, and especially for an ultra short throw projector. However, we did notice that on a solid black screen the black in the lower left quadrant was noticeably blacker than the rest of the screen. Input Lag. The test unit measured 170 ms input lag in video modes and 72 ms in Game mode. Fan noise. Fan noise is moderate and a bit louder than most home theater projectors. However, due to its ultra short throw, the projector is at the front of the room rather than just behind or just over the heads of the audience. Moreover, the noise emanates from the front of the projector toward the wall, so viewers seated at a typical viewing distance behind the PF1000U may not find it objectionable. With a surround sound system or some other robust audio source the fan noise typically gets lost, but you might become aware of it during quiet interludes. Setting the PF1000U into its Eco mode reduces fan noise to a whisper, but it also reduces brightness significantly. Since this projector is not overly bright to begin with, eco mode may only be appropriate for smaller screen image sizes and use in the dark. For those who live in the mountains, note that High Altitude mode is required when the PF1000U is operated at an altitude of more than 3,950 feet. Fan noise increases substantially in this mode to the point of being obviously distracting. The PF1000U needs to be perfectly level and perpendicular to the projection surface in order to achieve focus over the entire projected image. The unit has four screw-adjustable feet and it is worth taking the time to get the leveling absolutely perfect. If the unit is not level, or is not exactly perpendicular to the screen plane, you will not achieve sharp focus throughout the image. If you are using a pop-up or pulldown screen that is not perfectly flat, you may end up with some areas of soft focus in the image. Moreover, focus is more difficult to achieve at 100" than it is at 60"--the larger the screen image the tighter the tolerances for error. This becomes particularly critical with the display of graphics or text. On the other hand, a slight softening of focus on the edges of the image become much less noticeable with video material. Throw distance. The PF1000U sits right under the screen at the front of the room. It requires a throw distance of only 4.2" from the front of the projector to the screen plane to project a 60" diagonal 16:9 image. Since the projector is 11" long, the distance from the mirror to the wall is about 15". A 100" image can be achieved by moving the projector back about 3", so a tiny change in throw distance has a radical impact on image size. Vertical offset. With a 100" 16:9 image displayed, the projector is about 11" below the bottom of the image. 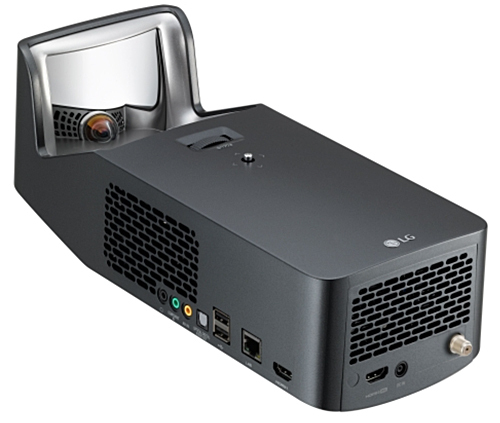 The LG PF1000U is a downright unique projector. If you need an 80" TV video picture with high resolution, high contrast, deep color saturation, ultra short throw, and 5 lb portability, this one was clearly designed with you in mind. It delivers a beautiful 1920x1080 resolution video image with good color balance and high color saturation, as long as the image size is kept within its ideal performance range. Its portability is a key advantage for those who need it. It is obviously not possible to haul around an 80" diagonal flat panel TV, and the PF1000U gives you the ability to do pretty much that. It may not have all of the Smart TV apps on board that you'd want, but it has Netflix, VUDU, YouTube and some others, and it can connect everything from mobile phones to tablets to USB memory sticks to DVD players and computers. Its 3-D performance is stable and artifact-free, and its wireless operation, particularly Miracast, was easy to implement. 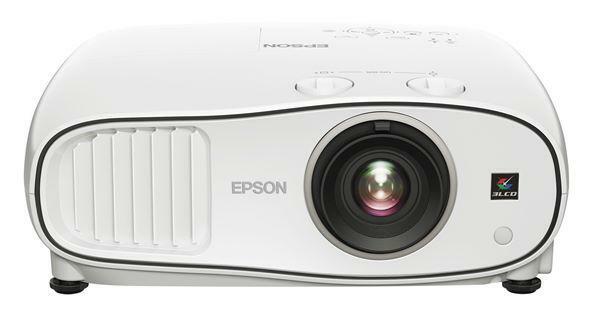 There are very few 1080p HD portable ultra-short-throw projectors available, and on-board TV is almost nonexistent. It has its flaws and idiosyncrasies like all projectors do, but for the most part they are unavoidable natural byproducts of the key benefits and unique features that it provides. In the end, it is a lot of fun in a little package. If you need what the LG PF1000U offers, there is no reason to wait. Brilliant design and possibly practical for an application I have in mind. I simply do not understand how nearfield projectors can maintain an even illumination on a large screen but apparently they do. Getting the screen perfectly flat would probably be much more critical though. I take it you would just have to move it in and out 2" or 3" to get a zoom from 40" to 80"
This is pretty cool. I would hope to see something just like this with double or triple the brightness, to get a 110" or 120" screen in a room with ambient light. I suppose there's some reason this is nontrivial with an LED, but here's hoping. I don't notice any difference between a 100 or 80 inches screen , I love this projector. This projector has solve my big screen problem. Because this product is very easy to move & set-up anywhere like notebook or other streaming device. I love this product.